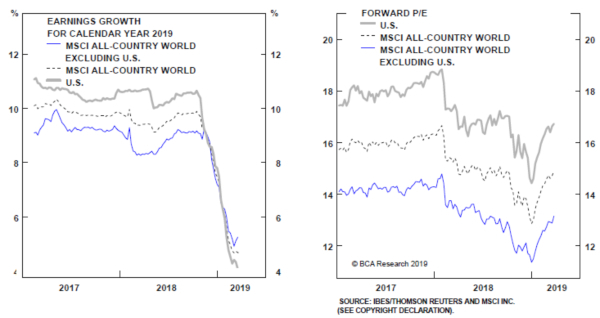 What a difference one quarter can make… The first quarter of 2019 was in sharp contrast to the final three months of 2018 when global equities experienced a correction driven by monetary policy, growth, and trade concerns. U.S. equities rebounded, posting the best start to a calendar year since 1998, while international stocks were not far behind. Cautious optimism has replaced the negative sentiment pervasive in capital markets at year end as investors have adjusted to the monetary policy pivot by the Fed along with a broad reset in earnings growth expectations. Below, we reflect on the moves that we made in client portfolios amid this evolving backdrop and share our outlook for financial markets. Entering 2019, sentiment reached pessimistic levels as investors reacted to tighter financial conditions, peaking earnings growth, and elevated geopolitical risks. At the time, we believed that financial markets were pricing in a deeper economic slowdown than the underlying data was suggesting. Economic growth was decelerating from an above-average pace but remained positive; the Federal Reserve was signaling an intent to be more measured going forward; and valuations were attractive. Given a more favorable risk-reward environment, we increased client portfolio allocations to equities above long-term strategic targets. Specifically, we eliminated exposure to bank loans and invested the proceeds in U.S. large cap and small cap stocks as well as reinitiated a position in emerging market stocks, which had been absent from client portfolios since mid 2018. Domestic stocks led the rebound in global equities during the first quarter with the S&P 500 returning 13.7% and the Russell 2000 index returning 14.6%. Emerging market stocks, as measured by the MSCI Emerging Markets index, returned 9.9%. Additionally, we utilized the market selloff to upgrade the quality of portfolios at year end. For example, we reduced exposure to master limited partnerships (“MLPs”) in favor of U.S. large cap stocks. While our outlook for MLPs remains positive, the ability to shift into businesses with higher quality balance sheets at comparable valuations was compelling. Furthermore, we removed the currency hedge in our international stock holdings based on a view that the U.S. dollar should modestly weaken over the intermediate term. While the dollar ended the quarter essentially flat, international developed market equities, as measured by the MSCI EAFE index, returned 10.0%. Lastly, in February, we established a tactical position in U.S. homebuilding stocks given a positive outlook for the U.S. housing market. In determining our outlook for financial markets and resultant client portfolio allocations, we focus on four mains areas: monetary policy, fiscal policy, underlying economic data and corporate fundamentals, and valuations. After signaling in December an intent to be more data-dependent, the Federal Reserve indicated in March that changes to its policy rate are unlikely in 2019. This pause in monetary tightening is reflective of weaker economic data coupled with continued benign inflation. Fixed income markets are currently pricing in interest rate cuts. 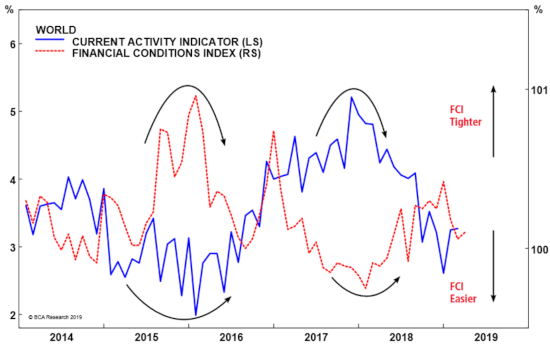 Consequently, as shown below, financial conditions have eased which should provide a tailwind for economic growth in the second half of the year. We do not expect the Fed to resume tightening without evidence of a sustained reacceleration of growth. With respect to fiscal policy, lower corporate tax rates and a looser regulatory framework should continue to provide a tailwind for economic growth, albeit a moderating one. While fiscal stimulus should support growth over the short term, rising fiscal deficits in an economic expansion potentially weaken the government’s ability to use it as a tool in the next recession. Although economic growth has slowed both domestically and abroad, underlying data remain healthy. The Fed is projecting annualized U.S. real GDP growth of 1.3% in the first quarter of 2019, down from 2.2% registered in the fourth quarter of 2018. While the government shutdown weighed on economic growth in January, history suggests that it will not have lasting effects. 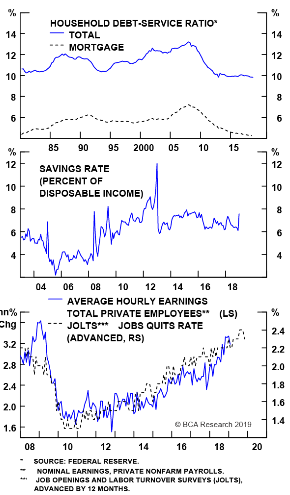 Any discussion of the U.S. economy should begin with the consumer, which, as depicted below, continues to exhibit positive fundamentals: household debt-service ratio below pre-recession levels, an elevated savings rate, and increasing average hourly earnings. Likewise, corporate fundamentals remain strong, as demonstrated by aggregate debt-to-assets below pre-recession levels and solid interest coverage. Capital spending intentions have weakened but reside above the historical average while manufacturing and service activities continue to expand. Additionally, the housing industry appears to be setting up for a recovery given declining mortgage rates, low vacancy rates, and an aging capital stock. In February, we initiated a tactical position in U.S. homebuilding stocks based on a view that improving fundamentals should translate into attractive returns. Overseas, monetary and fiscal policy remain accommodative although the capacity to stimulate growth seems muted. In Europe, easing financial conditions coupled with increasing trade should result in a pickup in growth. The health of China’s economy has important implications for global growth, and our outlook remains constructive. A bilateral trade agreement between China and the U.S. would likely provide a tailwind for global growth. On the monetary and fiscal front, Chinese authorities have enacted numerous measures to stabilize the economy. 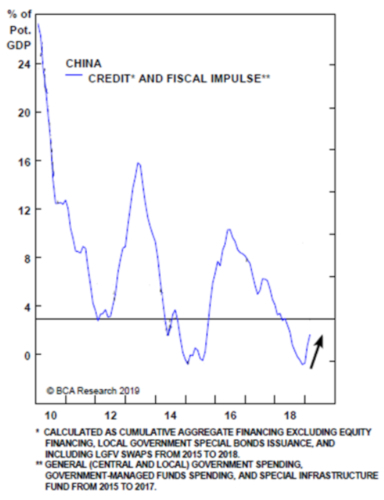 As shown below, credit and fiscal impulse appears to have reached a positive inflection point which should offer a boost to growth. A reacceleration of global growth would likely provide a tailwind for emerging market stocks. With these considerations, we initiated a modest position in emerging market stocks during the quarter. While our outlook for global growth and equity markets remains positive, the rebound in stocks has resulted in valuation multiples expanding back to levels that we associate with fair value. Although earnings growth expectations appear conservative, current valuation levels support pulling back our overweight allocation to equities in client portfolios (see below). Consequently, we have taken steps to lower equity exposure in line with long-run strategic targets. While we believe in the long-term benefits of global diversification, we continue to favor the U.S. over international markets given stronger underlying economic growth. We would consider increasing exposure to international equities with evidence of a durable pickup in global growth. Slower U.S. growth converging with international growth rates should result in a weaker dollar, representing a potential tailwind for global growth. In fixed income, we favor short-duration securities as a flat yield curve argues against taking maturity risk. We are emphasizing preferred securities to drive incremental income given our positive view of corporate health but overall remain biased toward quality in fixed income allocations. Looking ahead, we seek to balance the opportunities presented in a volatile market with the risks associated with the latter stages of a business cycle. If you have questions about this information or your investment portfolio, please contact a member of the Investment Research Team or your Advisor. Historical performance results for investment indices, benchmarks, and/or categories have been provided for general informational/comparison purposes only, and generally do not reflect the deduction of transaction and/or custodial charges, the deduction of an investment management fee, nor the impact of taxes, the incurrence of which would have the effect of decreasing historical performance results. It should not be assumed that your IA Firm account holdings correspond directly to any comparative indices or categories. Please Also Note: (1) performance results do not reflect the impact of taxes; (2) comparative benchmarks/indices may be more or less volatile than your IA Firm accounts; and, (3) a description of each comparative benchmark/index is available upon request.